Sprawl Is Good For You? There are times I pick up my morning Globe & Mail and wonder who selects their articles, especially in the Report on Business where investigative journalism does not exactly reign. A few days ago, right on the top of page B2, they had a piece of drivel by Brian Lee Crowley entitled “Sick of congestion? Build roads, not transit“. Is the Globe playing for the Ford Nation readership? Is their soon-to-be-neighbour on King East, the dwindling Toronto Sun, rubbing off on the Globe’s brand? Will being at the mercy of the King car give them second thoughts about downtown? After all, they’re also unable to plump for mayoral candidates who might be seen as part of the downtown elite even thought they might actually be competent for the position. As urban geographer Wendell Cox likes to say, this idea that road construction only worsens congestion is like believing that building more maternity wards will cause more babies to be born. This argument is a total non-sequitur because the issue is not cause and effect, but capacity and latent demand. The existence of a new, comparatively uncongested road will induce more driving simply by making this a more attractive option. More maternity wards do not, of themselves, make having a family more attractive. To continue the analogy, it would be like a construction program fixated with on ramps. Cox is no “urban geographer”, but an apologist for anti-government, anti-transit arguments going back decades. There are enough transit boondoggles in the USA for anyone to show how vast resources have been spent to build new lines of dubious value. The USA, like Canada, has a long history of spending on capital projects as a job creation scheme regardless of the intrinsic value of what is actually built. Pork barrel politics bring billions to cities and to the construction industry that feeds off of them. That does not make all transit a waste of money any more than recent subway debates would invalidate any transit spending plans for the GTHA. What those debates do achieve is to undermine the credibility of those who ask for more money when voters are suspicious that nothing of real value will be created. Only when one is well into Crowley’s piece, does one find the real heart of his argument — lower density cities with spread out jobs and populations, and lots of road capacity, are actually less congested and have shorter commute times than the more traditional configuration of downtown-plus-suburb we know so well. His poster children are Phoenix and Houston. Certainly, if one has a city with ample room to grow, a history of leaving wide swaths of land around main roadways, and a development model that favours decentralization, one can easily have uncongested roads. We saw exactly this in much of the 905 until growth caught up with road capacity and, suddenly, those quick trips through suburbia became a commuting nightmare. The problem is not just “downtown” but throughout much of the GTA. Crowley pulls a “bait and switch” on his readers giving the implication that he has a solution to congestion when, in fact, his answer is to not build denser cities in the first place. One can easily argue that there are many other benefits of density and that the effect on commute times is a trade-off we make for a more “urban” environment. Our problem in the GTA is that we only half-heartedly embrace a truly “sprawling” city. We already have a dense core, and the idea of keeping housing and jobs spread out all the way from Steeles Avenue to Lake Simcoe is not a model the development industry cares to follow. Crowley ends by exhorting planners to think of sprawl as part of their toolkit to make better, less congested cities. This is complete nonsense. He starts with the premise that where sprawling cities do exist, there is little or no congestion, but then reverses cause and effect to imply that sprawl can be used as an antidote. No, it doesn’t work that way. Our congestion already exists, and more sprawl won’t make it vanish. Neither will road building, at least on a scale we can afford and tolerate within our already-developed city. If anything, our problems are compounded by the demands of the industrial sector who want to see less congestion for their trucks and, by implication, a shift of road priority away from individual motorists by spending on alternatives like transit. Simplistic analyses like this may keep Ford Nation warm at night dreaming of more expressways (provided the roads and traffic don’t go through their neighbourhood). For the debate about Toronto’s transit future, Crowley’s empty and misleading thesis is a useless distraction. The TTC meeting presentation on Presto and my comments on it have been added, and the updates related to this topic have been reorganized to follow in chronological sequence. The past two years at TTC and Council have been all about the fight over LRT and subways, and the shifting loyalty to each mode especially when potential votes are to be gained. While Toronto (and Queen’s Park) flailed about with expensive rapid transit plans, something more important, but more subtle, off the radar, was happening. Discussion of the future of our transit fleet and service levels later this decade took a back seat in the triumph of ideology over planning. We are now in a position where all three modes — subway, streetcar and bus — will strain to meet demands placed on them for the foreseeable future. We will have very clean subway stations, but service and capacity are quite another matter. The problems for each mode are different. The Transit Investment Strategy Advisory Panel issued its recommendations on December 12. I have written a short review of them for the Torontoist, and will add more extensive comments here in coming days. The Neptis Foundation has published a long report which provides a serious critique of projects in the Metrolinx Big Move plan and proposes significant alterations to the proposed network. Everything is based on cost-effectiveness although the critique depends on implementation of the overall scheme rather than the usual piecemeal approach to network expansion. Of particular note is the need to regard GO as a high frequency, high capacity regional system closely integrated with local transit. There is too much in this report for me to comment on as I write this (midnight, December 11), but I will try to pull together more extensive remarks in the next day or so. Meanwhile, coverage of this report will appear in the Wednesday Star, and this is likely to stir up several hornet’s nests. The Downtown Relief Line disappears and its “relief” function is provided by a combination of GO Transit upgrades and increased subway capacity. The only service to Pearson Airport remains the Union Pearson Express which is considered to be profitable (operating cost recovery only) despite a conclusion to the contrary by the Provincial Auditor. The wider question of this service’s ability to absorb greater demand and a wider variety of traffic is not examined beyond a proposal for a “frequent user” fare that would attract trips by airport workers, not just business class travellers. Electrification of GO Transit is essential. Fare and service integration with GO is an essential part of the proposal. Several stations on the Eglinton Crosstown line would be dropped, and the proposed at grade section would become an elevated structure. This takes us back to a version of the Eglinton line originally pushed by Metrolinx as a regional facility, and begs the question of transit service to the now wider “in between” locations that would lose their stations. The Richmond Hill subway would also lose some of its stations pending contributions by developers along the line. The Scarborough Subway, LRT and Sheppard LRT would be converted to one consolidated, automated line to attract more riders. At first blush, I cannot help thinking that this report is hopelessly naive on a few counts. First, it depends on a co-ordinated scale of network expansion we are unlikely to see, especially for the GO component which is used to justify dropping other parts of the Big Move network. Second, there is a focus on cost-benefit that at first glance appears to preclude the function of new transit lines as part of a network. A related issue is the question of marginal new ridership where a large expenditure to improve the quality of service for existing riders is given no credit for that benefit as they generate no net revenue. Third, there appears to be no discussion nor appreciation of the role of local services for areas beyond the immediate reach of rapid transit stations. This is very much a return to the kind of thinking that infected early days at Metrolinx. I will leave further comments until I have a chance to read all of the details. Two studies came through Toronto’s Public Works & Infrastructure Committee at its November meeting revealing a less-than-coherent approach to traffic management and transit priority. Managing Toronto’s Congestion Today gives an overview of the current situation and factors contributing to congestion. The Congestion Management Plan 2014-2018 lays out specific proposals for what might be done to address various problems. Project Descriptions for 17 specific proposals. Project Schedules for each proposal. Detailed lists of changes to traffic bylaws that will be implemented. Most striking about these reports is the fundamentally different way in which they approach their subject. DTOS is very much about action, making specific changes “on the ground” to the way streets operate with the goal of improved capacity. This includes a more sophisticated form of Transit Signal Priority (TSP) that would take into account not just the presence of transit vehicles, but whether they were ready to proceed through intersections. By contrast, the CMP spends a great deal of time talking about the need for technology upgrades and for co-ordination among various agencies – City Transportation, TTC, Utilities, Emergency Services – to the point one might ask if any of them ever talk to each other today and, by extension, how much “congestion” there is simply in agency-to-agency co-ordination. TSP gets pushed to the back burner here with a suggestion that it be granted only when vehicles actually need it, although how exactly that would be achieved given TTC’s chaotic approach to line management is anyone’s guess. More to the point, the TSP facilities now in place were funded by the TTC, but City Transportation now proposes to hobble their usefulness. The TTC will make improvements in several routes in January 2014. Many of the changes are small-scale “tweaks” and we have yet to see system-wide benefits from the fare increase that will take effect on January 1. The Service Budget does show some increase over past years. The values above do not include construction services, that is, additional vehicle hours required to accommodate construction projects which vary from year to year. Although some construction-related costs are charged to the capital budget, construction service takes buses and operators that are not available for regular service. In a year with many construction projects, this can delay the onset of service improvements elsewhere. Despite budgetary constraints, the TTC was able to increase service in 2013 because its actual costs for 2012 were below budget. The 2013 subsidy was “flat lined” at the 2012 level, but the effect on an “as spent” basis was that the subsidy dollars rose in 2013, and the burden of additional service did not fall entirely on the farebox. In 2014, there is a real dollar increase in the subsidy coupled with higher fares. 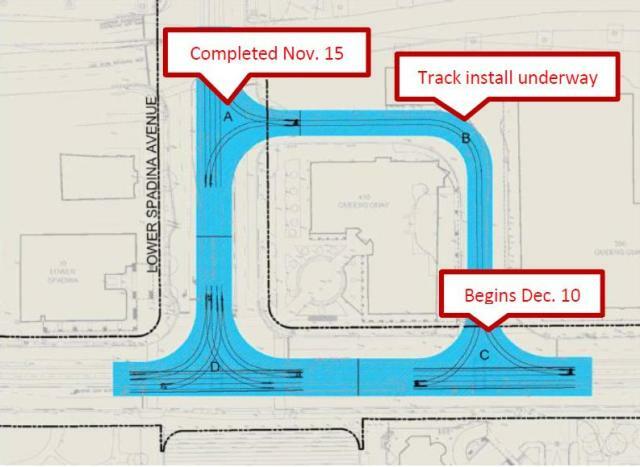 Construction on the King Street approach to the bridge at the Don River will take longer than originally expected, and diversions will now remain in place until April, according to the TTC’s diversion notice. Construction downtown has made for unreliable operation of the integrated service on Pape and its longer branch via Commissioners Street to downtown. Pending completion of the construction (mainly the work at Union Station), the route will be split. 72 Pape will operate from Pape Station to Cherry & Commissioners looping via Cherry, Villiers and Munition Streets. 172 Cherry will operate from St. Andrew Station to Cherry & Commissioners and will use the same loop as 72 Pape. On Sunday evenings, matching existing schedules, there will be no service on 172 Cherry, and the 72 Pape route will terminate at Eastern & Carlaw. Midday service between Davisville and St. Clair stations will be discontinued.